After people saw the Blue Planet II footage of albatross parents unwittingly feeding their chicks plastic and mother dolphins potentially exposing their new-born calves to pollutants through their contaminated milk, the campaign against the excessive use of plastic gained a lot more adherents. David Attenborough expressed that he was ‘absolutely astonished at the result that that programme has had’ and noted the impact on politicians and businesses and the reduction in people’s single-use plastic footprints. There are campaign and activities ideas. The influential series is linked to the OU, particularly Dr Mark Brandon and Dr Philip Sexton. Listen to Janet Sumner interviewing OU consultants to the Blue Planet II TV series. There is more here and here and you can get an OU ‘Oceans’ poster. This is part of an OU tradition of producing widespread, lifelong learning beyond the syllabus. Its early modules, courses included material broadcast on BBC television and radio. There was initial scepticism from some academics and Conservative politicians. However, the OU was committed to using television and sought to employ innovative approaches. The programmes had to address both registered students and the wider public. The result was varied informative programmes which positioned viewers as interactive learners and presented learning as a problematising and experiential activity. As the first Dean of Arts, John Ferguson, complained, ‘It is a common delusion about the Open University that we “give lectures on TV.” We do not “give lectures” at all.’ The OU had its own purpose-built television studio complex at Walton Hall, which enabled it to produce, for example, a video which generated three-dimensional images of the brain for the Biology: brain and behaviour course. For Haemoglobin, Programme 1 of Biochemistry and molecular biology, S322 (1977–85), Max Perutz used a static model, moving graphs, equations, diagrams, a clip of an experiment and a view down a microscope as well as lecturing to camera. Robert Bell, an OU lecturer, recalled ‘seeing an early Maths programme shot on a rubbish dump, and certainly many of them involved ingenious working models that would have been unavailable then in a conventional university’. The materials for Drama, A307 (1977–81), included the transmission of sixteen fifty-minute plays. Samuel Beckett’s Endgame was given its television premiere on an OU transmission of 90 minutes in duration. Students were told ‘Do not regard each programme as definitive … you should bring your free and concentrated response and your informed critical judgment’. 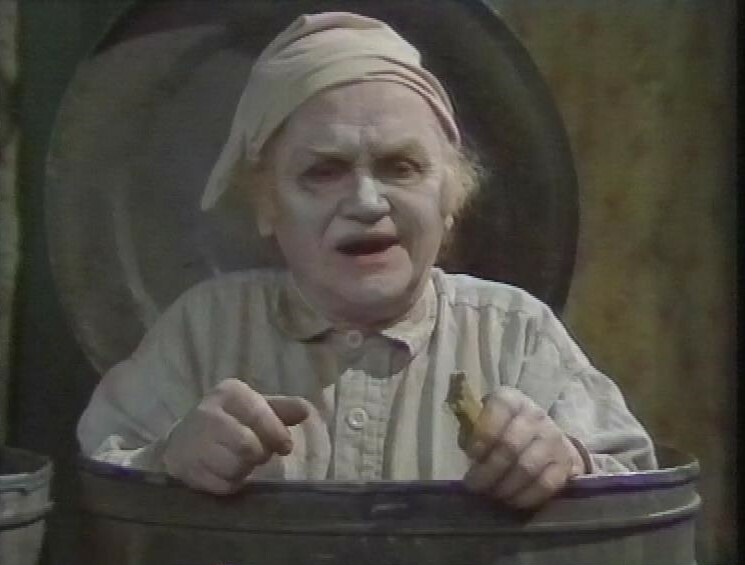 Charlie Drake in a dustbin in the BBC and OU version of Endgame. To develop students’ critical awareness of how each performance of a play was an interpretation of the text there was multi-camera work in the studio and televised scenes from Aristophanes’ Clouds, in which Socrates appears as a character. In the broadcast’s introduction John Ferguson is shown with cameras around him and there is a moment when both a Greek character – Strepsiades, played by Juan Moreno – and the Dean are in shot. Similarly, Shakespeare’s Hamlet was not presented as an uninterrupted performance. Instead academics discussed different ways of interpreting individual scenes. These interpretations were illustrated through performances by actors. How was all this received? Audrey Moore, who started her studies in 1974, recalled that the television programmes were often on early in the morning and she was ‘frequently rather tired going to work’, but one programme, on the Cuban revolution,’ inspired me to want to sing and dance all the way to work’. After nearly ten years as Vice-Chancellor John Horlock was able to claim that millions had, through the OU broadcasts, ‘obtained further education “by osmosis”’. Blue Planet II is a stunning achievement, and one built on years of experience and co-operation between the broadcasters and the educators. This entry was posted on Monday, August 6th, 2018 at 12:01 am by Daniel Weinbren	and is filed under 50 objects, BBC, Methods, television. You can follow any responses to this entry through the RSS 2.0 feed. You can leave a response, or trackback from your own site.